Sahrish Ahmad is a clinical psychologist at Lahore’s Jinnah Hospital. In 2013-2014, while she was doing her masters, she proposed a research study on Rescue 1122, a public sector emergency service set up to help people caught up in accidents, fires and other emergencies. Her teachers at the Centre for Clinical Psychology at the Punjab University, Lahore, accepted the proposal immediately. To start working on her research project, Ahmad first contacted Rescue 1122 to get the contact information for possible respondents. Senior officials at the rescue service, however, turned down her request on the grounds that all contact information of the callers who seek help is kept confidential. She then contacted her class fellows, friends and relatives for help in reaching out to anyone known to have sought – and received – help from the rescue service. Finding such people turned out to be quite easy. Hundreds of thousands of people in different parts of Punjab have used services provided by Rescue 1122 over the last 10 years or so. Between 2004 and 2014, the rescue service has handled over 1,159,667 road traffic accidents, responded to 1,465,344 medical emergencies, dealt with 121,387 crime incidents, managed some 5,918 collapsed buildings, provided rescue in 6,904 cases of drowning and responded to 70, 232 fire incidents in all districts of Punjab, a Rescue 1122 performance report, issued in 2014, reads. After getting to scores of people who were behind some of those calls for rescue, Ahmad identified five of them through sampling methodology advised by her supervisors, Tehreem Arshad and Dr Rukhsana Kausar. These respondents were all young – aged between 22 and 27 – and belonged to middle class families. She interviewed them in detail, asking both quantitative and qualitative questions. Thematic analysis of those interviews revealed that the overall level of satisfaction with Rescue 1122 performance was high. 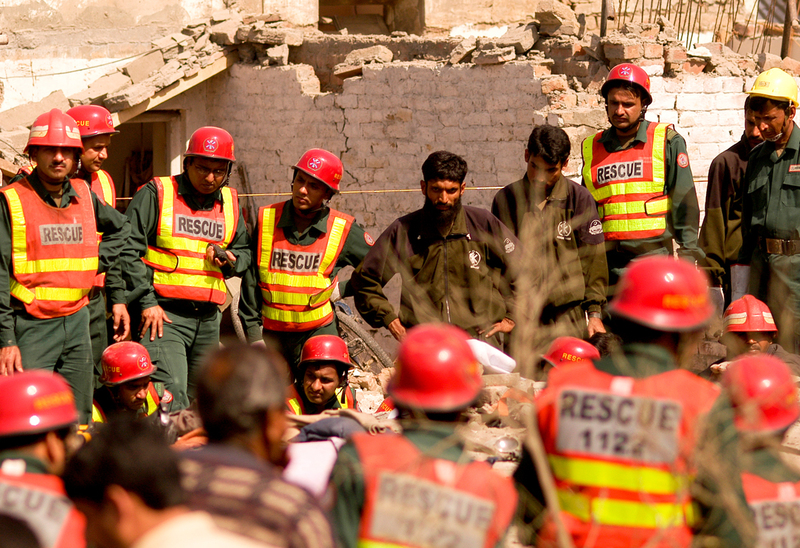 The respondents regarded the rescue workers as “professional, empathetic, dedicated and calm.” They also rated the rescue service as having better infrastructure in comparison to other emergency services in Lahore. Ahmad’s hard work notwithstanding, this is not a conclusion that one needs a research project to arrive at. Opinion on the streets of Punjab in general, and Lahore in particular, about the quality of Rescue 1122 services is mostly positive. People like Dr Yaasir Ijaz, a Lahore-based anesthetist in his early thirties whose friend met an accident after Eid last year, go to the extent of saying they would have lost their near and dear ones had there been no Rescue 1122. Shaukat Niazi, a 53-year-old language and linguistics expert in Rawalpindi, cannot agree more. “Once a cousin of mine fell from the stairs and broke her nose. [I called Rescue 1122 and its staff] was there in five minutes to administer emergency medical aid,” he tells theHerald. “They were very professional.” Niazi also talks about how the rescue service helped him shift his father to a hospital. “We could not do the shifting because of his spinal injury so I called Rescue 1122.” The ambulance arrived in a few minutes, with stretchers and all. “Four rescuers handled the situation like no other ambulance crew could,” Niazi says. Meet Irfan Gull. Dressed in an olive green uniform, he looks set to step into a battle zone. With his hands tightly clutching the steering wheel of a red-striped white high roof van, he only needs to turn the key in the ignition – and get orders from his seniors – to speed off to his mission. Not to save the borders or fight the terrorists, though. 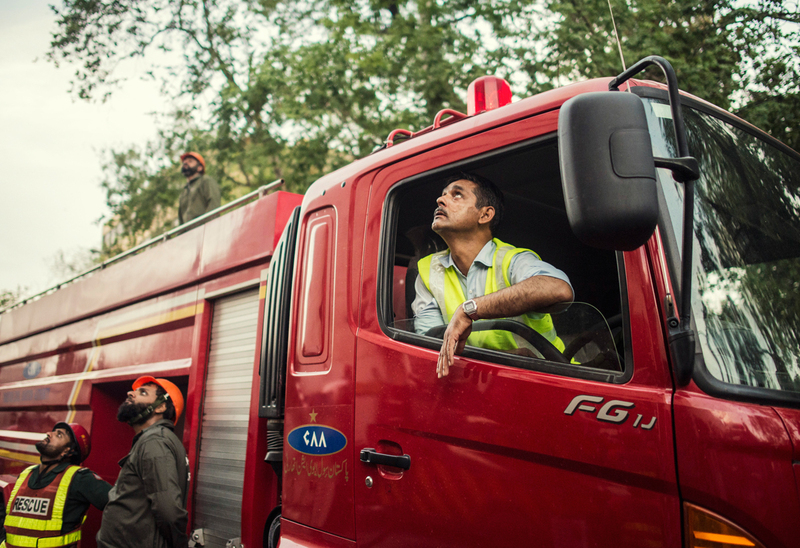 He, instead, fights fires and other emergency situations that can arise anytime anywhere within the municipal boundaries of Lahore, where he works. He is an ambulance driver for Rescue 1122. 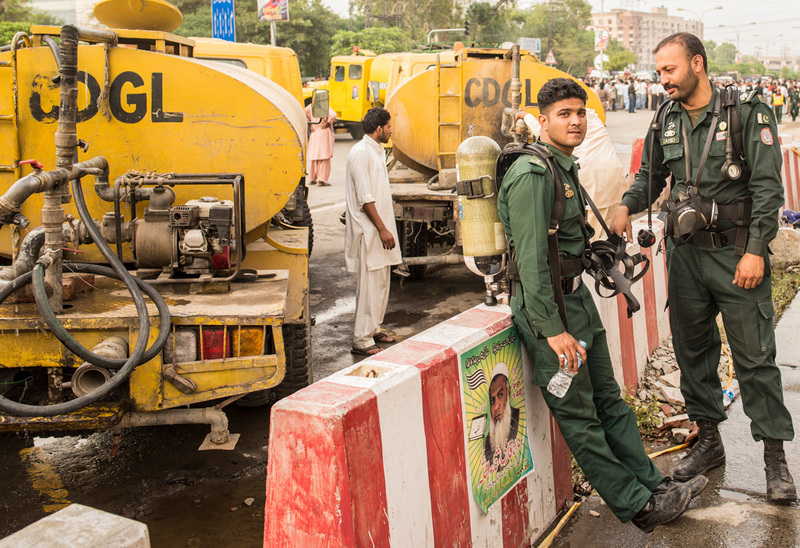 Only 12 years ago, Lahore – as well as the rest of Pakistan – did not have an ever-ready, resourceful and dedicated workforce to take care of such emergencies. There was, of course, a fire brigade in every big city but its staff was not trained to do anything beyond spraying water and other liquids on a raging fire. They could neither provide first aid nor did they have ambulances to transport the injured to a hospital and the dead to a mortuary. Those who met road accidents had no government department to look for help, leaving it to the passers-by to use either their own vehicles or hire rickshaws or taxis to carry the dead and the injured to nearby medical facilities. And this, too, was only possible when the passers-by were able to shrug off the apprehension that helping the victims of the accident could entangle them in legal and police proceedings which nobody has the time and stomach for. Wherever ambulances were available, mostly at government hospitals, they were generally ill-suited to tackle emergencies because they neither had equipment for first aid nor trained human resources to administer first aid. For Gull and his colleagues, lack of availability of equipment can determine the difference between life and death. As his colleagues try to breathe life back into the rescued persons inside his ambulance on bumpy roads, Gull has to navigate the mean streets of the city where traffic never gives way. Having to spend endless hours on the wheel, ensuring a quick response time and safe driving simultaneously, is extremely stressful, he explains. Gull’s colleague Faisal, a medical technician, bitterly remarks the government pays no attention to improving wages and working conditions at Rescue 1122. “We are often promised revision in our service structure. We also hear that a commission will be set up to identify the problems in the service structure but at the end of the day everything remains the same,” he tells the Herald. Faisal also talks of a catch-22 situation: the hiring of more staff to reduce the workload on the existing workers will also lead to the worsening of the already bad financial status of the rescue service because the provincial government has failed to increase annual monetary allocations for it. A part of psychologist Ahmad’s research concerns exactly that: the stress the rescue workers have to endure. A high proportion of Rescue 1122 staff that participated in her research was found to be experiencing psychological distress, she says. “No, we are not God,” says Gull with a sigh when asked how difficult it is to maintain a high level of performance under working conditions he does not like. “We are humans. When we get exhausted, we can make mistakes too,” says Faisal. Opinion on the streets of Punjab in general, and Lahore in particular, about the quality of Rescue 1122 services is mostly positive. Furqan Noor is a telephone operator at Rescue 1122 in Lahore so, unlike Gull and Faisal, he does not have to venture out on the streets to help people in distress. Yet, he feels immense emotional and psychological pressure whenever he is on the phone receiving calls for help. “Often, I am holding back tears when I am answering calls,” he says. “Someone’s baby’s heart is not beating and the mother is screaming on the phone,” he narrates one of the many heart-wrenching stories he is privy to. A woman once called him and said she wanted to commit suicide. She told him that she had been beaten up by her husband and that she did not want to live anymore. And then she asked him about the easiest way to die. He tried to talk her out of it but he is not trained to handle such a situation. “We are trained to be calm and cooperative while at the same time trying to extract information like the address and directions,” says Noor. Ahmad’s research finds that fielding such distress calls is an emotionally draining assignment. When rescue workers have to deal with highly emotional and tragic situations as a matter of routine, that can make them insensitive, she argues. Clinical psychologists call it “compassion fatigue”. She recommends that immediate steps should be taken to monitor the psychological and mental health of rescue workers and instant remedies should be provided to those who require them. Dealing with emotional problems of those seeking help, and also their own, is not the only worry that operators at Rescue 1122 face. To deal with a huge number of fake calls for help is a much bigger problem to them. In Lahore, for instance, only seven per cent to 10 per cent calls received at 1122 helpline are genuine requests for help. All the rest are fake alarms that lead to the unproductive deployment of scarce rescue resources. A prankster reporting a fake fire would make five to six fire engines, an ambulance and many rescuers rush to the site. Some callers even try to flirt with female operators or female medical attendants dispatched to help them, says a Rescue 1122 official in Lahore. Those making fake calls, according to the law, can be arrested and imprisoned for six months besides being liable to pay fines ranging from 50,000 rupees to 70,000 rupees. But senior officials at the rescue service say they have no time and resources to pursue the fake callers in courts of law. Those working in the field say they sometimes experience much bigger insults than the embarrassment caused by fake alarms. We have been “attacked, bitten, spat on” by the irate public, claims Gull. When Rescue 1122 was first set up in Lahore, Chaudhry Pervaiz Elahi was Punjab’s chief minister and his Pakistan Muslim League–Quaid-e-Azam (PMLQ) was the ruling party both in the province and at the centre. Though his family and him have been living in Lahore for decades, they are known as the Chaudhrys of Gujrat, where they come from, and are usually elected from. They do not have a constituency in Lahore to call their own and are considered rank outsiders compared to the Sharifs, the family of the incumbent chief minister, Shahbaz Sharif. Setting up Rescue 1122 in the provincial capital before anywhere else is seen by political pundits as a calculated move by Elahi to attract at least some public support in the biggest city in the province. That still rankles with the Sharifs, goes the widely circulated conspiracy theory among the residents of Lahore when asked about why the Punjab government is reluctant to increase the annual budget for Rescue 1122 and improve the working conditions of its staff. There appears to be at least some truth to these theories. Recently, newspapers in Lahore carried Rescue 1122 ads seeking donations to improve the service’s finances. Many in the city were upset over the ads. Why is a government department asking citizens for donations, they wondered, and lashed out at Shahbaz Sharif for ignoring Rescue 1122 while spending generously on his own public transport projects. Others were confused. Is a government department even authorised to seek donations? Senior officials at the rescue service respond to that by citing the Punjab Emergency Service Act of 2006. “The service shall have the authority to accept donations in the shape of land, vehicles, equipment and other such items which may facilitate the functioning of the service,” reads a section in the act. Seeking donations, the officials say, is perfectly legal. While the provincial administration almost ignores calls from Rescue 1122 staff for more money and machines, it is aware that the rescue service is quite popular and shutting it down will be a politically disastrous step. This neither here nor there kind of approach is creating a situation where the quality of the rescue service will only go down as population increases and human resources and machinery required to cater to its needs become exhausted and worn out. Many people already have complaints. Salman Muzaffar, an Islamabad-based banker in his mid-forties, got into a fight a few years ago and needed Rescue 1122 help to get to a hospital. He says the rescuers came to him quickly but their ambulance had severe hygiene problems. It was in a shambles, requiring cleaning and maintenance. Others have more serious grievances. Arooj Zahid, one of the editors at a popular magazine in Lahore, called Rescue 1122 recently after her grandmother had experienced severe breathing problems. The rescuers took more than 45 minutes to reach her home. By that time, her grandmother had passed away. “They were late because they could not find the address,” she says. Elishba Karis Abel, a 28-year-old teacher in Lahore, faced a similar problem when she called Rescue 1122 for help. The rescuers were required to shift her grandmother to a hospital at 4 am, she says, but they could not find her home. After wandering around the area for quite some time, they called her brother to seek directions. And then her mother had to drive in front of the rescue ambulance to show them the way to the nearest hospital. “Even a short delay can be critical for a patient who needs immediate medical care,” says Abel and suggests that the government should equip the rescue service with a navigation system so that rescue workers do not lose their way. Abel also wonders about the problems that the rescue workers could be facing while trying to rescue people in the countless narrow lanes of Lahore’s Walled City which are not even mentioned on the maps available in the markets. There have been a number of horror stories of people living in the Walled City not receiving timely help in emergency situations, she says. One such tragic story unfolded on January 14 this year. At least five members of a family were killed as a house caught fire in the Lohari Gate area of the Walled City. The nondescript narrow lane where the house was located was so difficult to locate and so inaccessible that it took the rescuers too long to reach there in time to save lives. 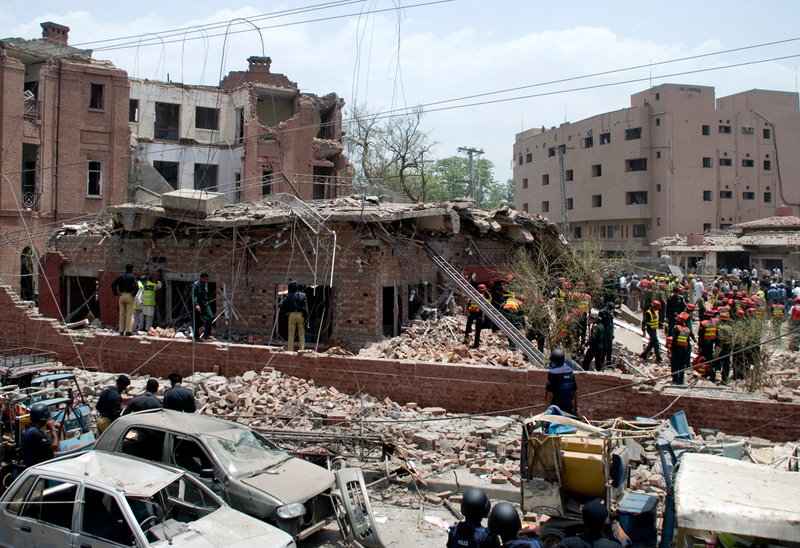 In a similar incident on May 17, 2015, six children belonging to another family lost their lives after their house had caught fire in Lahore’s Shad Bagh area which is not even in the Walled City — though it is equally densely populated and difficult to navigate. Gull apportions some of the blame for problems in service delivery to the condition of the ambulances available. When he started his job, he says, he was given a Mercedes-Benz Sprinter to drive. The second batch of ambulances was all Toyota Hiace vans but lately most vehicles procured in the first two batches have been replaced by Chinese Kinglong Hiace vans. These are five to six times cheaper than the Sprinters — and twice as inefficient, he says. Even where the equipment exists, it is woefully short of the numerical requirement. For Lahore, the country’s second biggest city and Punjab’s largest, Rescue 1122 has 27 ambulances and 20 fire trucks, according to its own 2014 performance report. This means just one ambulance for 370,370 people (supposing that Lahore’s population is still 10 million). The rescue service has only two turntable ladders and two aerial platforms, both essential tools for putting down fires in multistorey buildings and for tackling other high altitude disasters. Another big issue afflicting Rescue 1122 is the lack of a service structure for its employees. In the absence of a service structure, no rules and regulations are available for raising salaries and making transfers and promotions of the staff possible. If media reports are to be believed, senior rescue service officials have promised a number of times that a service structure will soon be put in place but nothing has come out of those promises yet. A Rescue 1122 official tells the Herald the rescue service cannot take any decision on the service structure on its own and that this is causing delays in announcing it. Approval of the service structure is the prerogative of the Punjab government’s home department, he says wishing to remain unnamed. In November 2015, a multistorey factory making polythene bags in Sundar Industrial Estate near Lahore collapsed, resulting in the death of more than 50 people, many of them as young as 14 years old. Evidence has piled up since then that the factory had a poorly planned building. It had no emergency exits and its owner had continued expanding it through unapproved extensions. Eyewitnesses told the media after the collapse that the building had developed cracks after an earthquake in October 2015 and even then the owner, who also died in the accident, was not ready to evacuate the workers and shut it down. Many of the deaths at the factory could still be prevented if the rescuers had the right type of equipment to cut through the collapsed concrete columns and heavy cement slabs under which scores of people had gotten trapped. As it turned out, Rescue 1122 did not have the technical skills and machines to remove debris without increasing risks to the lives of those to be rescued. 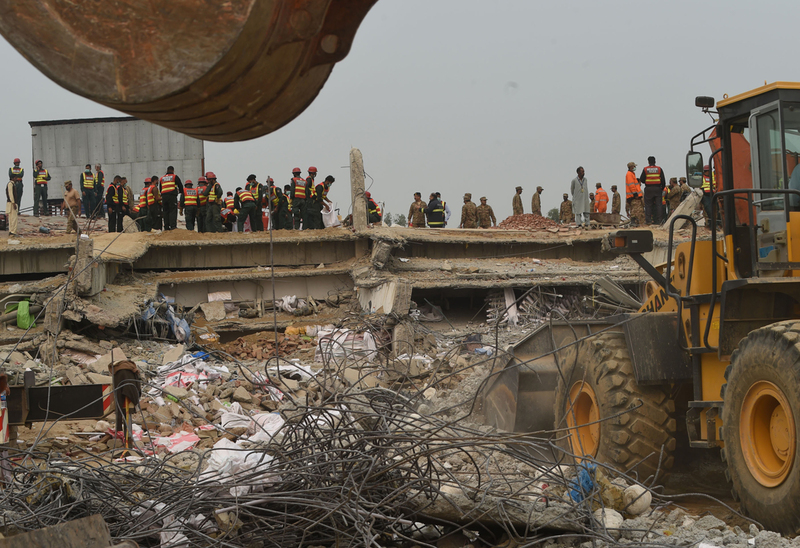 In the event, army engineers had to be called out to dig and smash the collapsed structure and heavy machinery – such as cranes, bulldozers and dumper trucks – had to be borrowed from private builder Bahria Town for debris removal. Even then it took close to a week to clear all the debris – a massive 17,200 tons, according to the district administration – and retrieve all the injured and the dead from under it. While the district administration was full of praise for the private builder for providing help in tackling the disaster, there was loud criticism of the government over failing to monitor, and stop, the flawed construction of the building before it collapsed and, most importantly, for not having invested enough in rescue services. Dealing with emotional problems of those seeking help, and also their own, is not the only worry that operators at Rescue 1122 face. To deal with a huge number of fake calls for help is a much bigger problem to them. For Gull and his colleagues, lack of availability of equipment can determine the difference between life and death. He recounts how in December 2014 he was ordered to rush to Anarkali bazaar where a commercial building was on fire. Along with him were 16 fire engines and 80 firefighters. They reached the site of the fire in eight minutes but could not make it inside the narrow street where the building was actually located for the next 45 minutes. 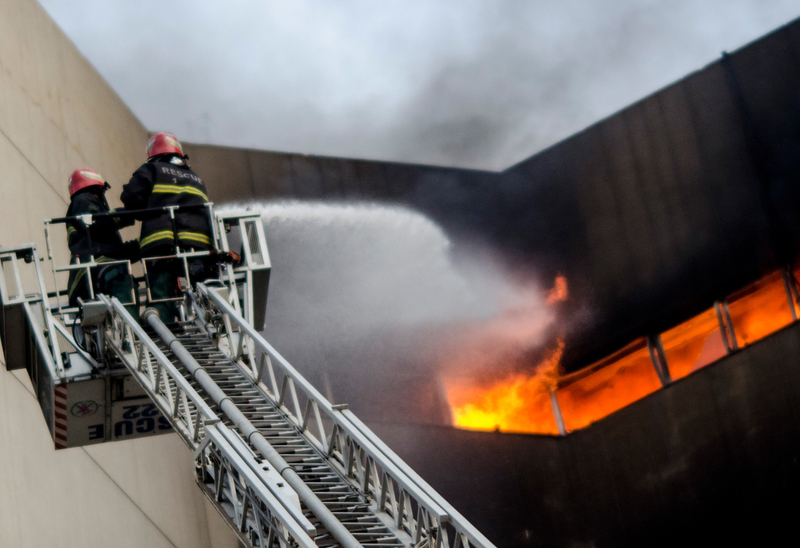 The building – which had only one entry and exit point – burned down in front of the rescuers as they struggled to carry water hoses and fire extinguishers inside it. Even more unfortunately, the accident resulted in the death of 13 people. The rescuers needed to cross many hurdles before they could start extinguishing the deadly fire. Hundreds of motorcycles were parked where the narrow street leading to the building branched off the main road. Vending carts clogged both the street and the road. And there were no hydrants, no fire extinguishers close by. Even the staircases and the parking areas were turned into shops, making it impossible for the rescuers to move within the burning building. Long-neck cranes could have helped the rescuers avoid all these impediments but Rescue 1122 does not even have enough high ladders. The lack of these ladders was felt acutely when the Lahore Development Authority (LDA) Plaza caught fire on May 9, 2013. 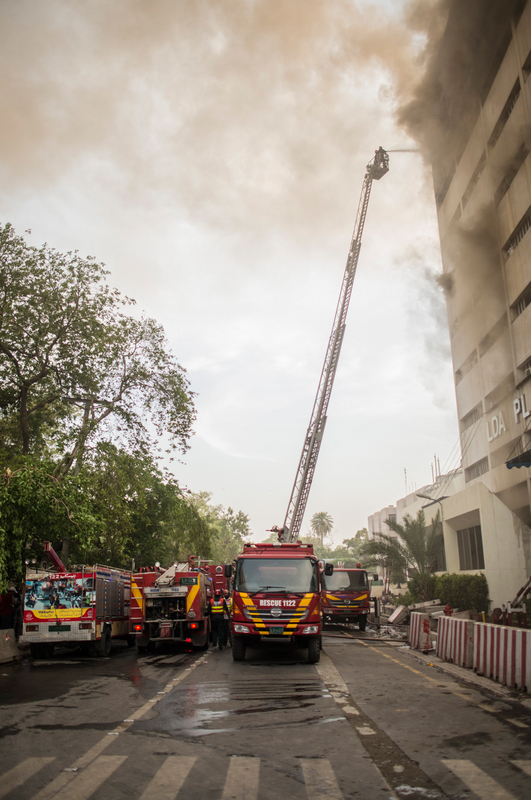 The LDA officials claimed the fire took long to extinguish because the rescuers did not have the required equipment to reach beyond the plaza’s sixth floor. In another glaring instance of equipment shortage, Rescue 1122 had only 12 life jackets and three to four rafts to rescue the entire population of Muzaffargarh district in 2010 floods. In some incidents, the lack of proper equipment has endangered the lives of the rescuers too. Back in 2011, four firefighters fainted while fighting a massive fire in one of Lahore’s most crowded commercial areas, Shalmi Market, inside the Walled City. Some rescuers recall the inferno on December 20, 2008, at Rawalpindi’s Gakhar Plaza with shock and horror. As this commercial building caught fire, rescuers rushed to it, but found out that they had no cranes or high ladders to be able to vacate it in time and put out the fire without having to enter the burning premises. Many of them went in as parts of the building were already crumbling around them. This resulted in 13 of them getting trapped in raging fire and falling debris. All of them were later found dead. Suggestions vary on how to expand the Rescue 1122 coverage, both geographical and in terms of disasters it can handle. Some say it needs to equip and train itself to handle emergencies such as animal bites, disease outbreaks, chemical spills, torrential rains and storms, flash floods and terrorism. 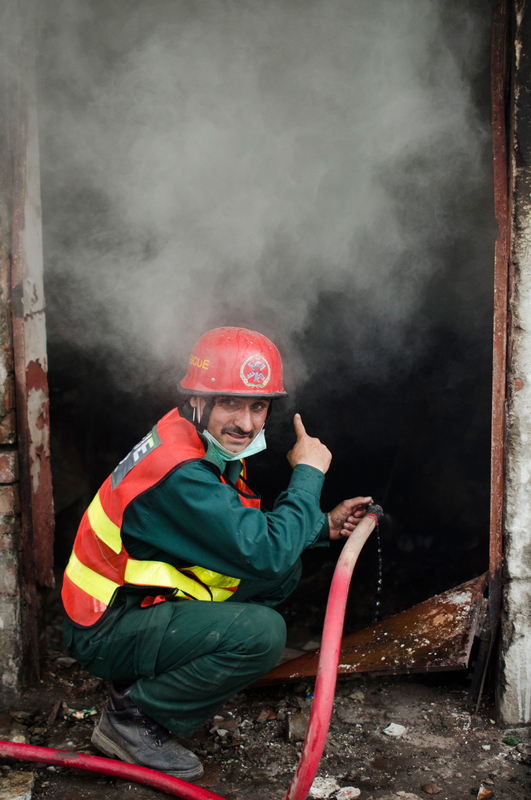 Others, like Rameez Ahmed, a textile engineer at a factory in Multan, say rescue services need to spread awareness among the general public on how to manage low intensity traumas and disasters such as non-fatal accidents and damage done by localised weather phenomenon. Office for the Coordination of Humanitarian Affairs of the United Nations in its 2012 report on Pakistan also recommended the same. It noted that Rescue 1122 had been advised (by the UN) to spread awareness and education among common people regarding first aid, disaster and trauma management. The rescue service, indeed, is doing just that, though on a small scale, by providing training to students but the compilers of the report were not satisfied. Rescue 1122 has failed to do that because of lack of funds, they noted. Yet another suggestion is that Rescue 1122 should extend its services to remote and underdeveloped places where people are prone to medical emergencies but have next to no healthcare facilities available close by to address those emergencies. More often than not, patients die while being transferred to a far-off hospital. Rameez Ahmed recounts how his friend died recently of a cardiac arrest in Narowal, a town about 50 kilometres to the north-east of Lahore, because there was no hospital in his hometown that offered treatment for coronary diseases. If a Rescue 1122 ambulance was available to transfer him quickly to a hospital in Lahore, his life could have been saved, says Rameez Ahmed. Consider how people suffer similar tragedies in far-off places such Layya, Bhakkar, Rajanpur and Sadiqabad which are all hundreds of kilometres away from a decent healthcare facility. To a certain extent, Rescue 1122 is already operating in some remote areas of Punjab but its services are limited to major cities and towns and the equipment available there does not even match the one available in Lahore. The expansion is also impeded by a lack of funds and absence of coordination between local hospitals and emergency service providers, sources in Rescue 1122 say. While these issues await resolution, Gull and Faisal just keep doing what they have been doing for years — providing help to people in need of rescue. And they continue to plead to “the powers that run the country, the many health ministries, secretariats and departments, the prime minister and the chief minister” to allocate sufficient funds for the rescue service. “We might just have to rescue you someday,” they seem to be saying to all these policymakers. This was originally published in the Herald’s February 2016 issue.